I recently had a cooking session where friends and I made homemade pasta. One pasta that's popular in German cuisine is spaetzle. It's also a homemade pasta that's made with a simple dough of flour, eggs and salt. This dough is then cut into thin noodles and dropped in boiling water to cook. Alternately, many folks use a Spätzlepresse, which is a tool that the dough is smoothed over and the dough comes out in small little bits, which is then boiled. Either way, once the spaetzle floats to the top, they're done. What makes this an even more special recipe is that the spaetzle is topped with grated cheese and broiled to a golden brown. 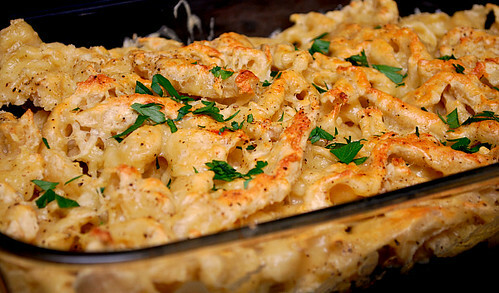 The cheese adds a wonderful, rich flavor and gives it a more color too! Place the flour in a bowl, add the eggs, 1 teaspoon salt and about a smidgen over 1/2 cup [actually, more water may be needed than this, dough should be only somewhat thicker than pancake batter] lukewarm water, and mix forcefully until the dough is bubbly. Let the dough rest for a few minutes. Peel the onions and cut into thin slices. Melt the butter in a pan, then add the onions and saute until golden brown. Preheat the oven to 400°F. In a pot, bring 2 quarts salted water to a boil. Spread the dough in portions on a damp cutting board, smooth it out and with a knife, cut thin slices over the water so they drop in as you cut (here’s a video showing how this is done). (You can also press the dough by portions through a Spätzlepresse into the water.) As soon as the Spätzle float to the surface of the water, remove them with a slotted spoon, drain the water well, then place them in an oven-proof casserole dish. Sprinkle with pepper and a little of the cheese and place in the oven. Proceed with the preparation of the next portion, layer it on top of the portion in the oven, and add pepper and some cheese. Atop the final layer of Spätzle, distribute the onions and butter. Raise the temperature to 250°C (480°F) and bake the Spätzle for about 5 minutes (or you can place it in the broiler until lightly browned.) Remove from the oven, sprinkle with more pepper and the rest of the cheese. I made a version of these a few months ago - and the kids loved them! I think a cheese version would be phenomenal. This looks SO delicious, Joelen! 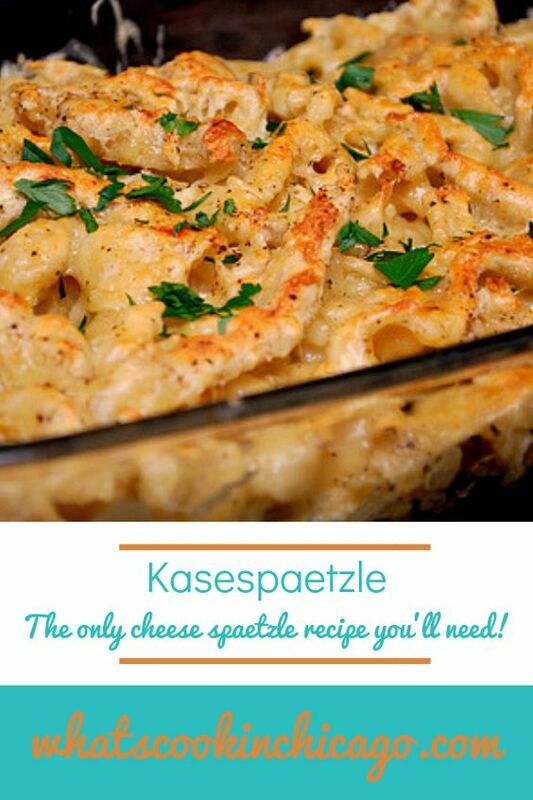 I love the texture of spaetzle, and I can only imagine how flavorful it would be with the addition of cheese. Thanks for sharing! I've never tried this but I agree with PP, that pic makes it look so appetizing that I might have to give this a try! WOW... I'm so sorry I missed this event!!! I spent a summer in Germany and I LOVED spaetzle. I've never tried to make it at home- this recipe looks fabulous! ohh...this stuff is so good!! i had a german housemate in college who used to make it for us--yum! !